Song by Letter Series includes the Melody in Easy to Read/Large Print. 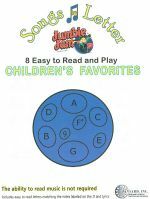 The notes are marked by letter which match the notes marked on the Jumbie Jam. No CD Included. Childrens Favorites include Twinkle Twinkle, Mary had a Little Lamb, Old McDonald had a Farm, This Old Man, Row Row Row your Boat, Doe A Deer, Chopsticks, When the Saints Go Marching In.